For an island with so much rain we remain shuddering in front of a fire most of the time, we certainly have a surprising love for outdoor music festivals. We look at some of the best ways to spend your weekends in Ireland this summer and the top ten music festivals. Is there a greater feeling in the world than the adventure that greets you as soon as you step inside the gate of Ireland’s headline arts and music festival? For newcomers and veterans alike, each year brings wonder and magic from the creative earthy hub of laid-back Body and Soul to the Bacardi tent pumping out tunes akin to an Ibiza beach bar through day and night. The line-up this year already includes Florence and the Machine, Underworld and Hot Chip so we’d scoop up our tickets now before they inevitably sell out. All of the beauty of the Body and Soul area at Electric Picnic wrapped into it’s own lovely festival. You never know what you’ll come across in this wonderland in Ballinlough Castle. Installations at every turn and the opportunity for a midnight jacuzzi, what could be better? Often voted among one of Europe’s best small festivals, Castlepalooza revolves around Charleville Castle, Co. Offaly and offers a small community of music worshippers a safe haven of fun for the August bank holiday weekend every year. Acts often include many local Midlands groups as well as many up and coming artists before they play Electric Picnic. Possibly Electric Picnic’s main contender for high-profile headliners, Longitude holds the beauty, for Dubliners at least, of being able to return home to your own bed after all the excitement of the musical day. Held in Marley Park, the small festival site with big names sees thousands flock through the city’s streets to see names such as Hozier and Chemical Brothers. Three fun-filled days of gigs, workshops and masterclasses throughout pubs and venues in Westport, Co. Mayo. Spend your weekend listening to a double bass belt out the perfect blue-grass rhythm in a beer garden on Ireland’s west coast. The best thing about this festival is that the vast majority of the events are free! Westport is also a lively and beautiful town which makes this festival a perfect stopover point if journeying along the Wild Atlantic Way. A festival very much living up to its name, this little weekend takes over the incredible grounds of Killyon Manor and fills them with love. With yoga, film and lively discussions accompanying the music, this festival is an experience for those ready to share their minds with the festival’s community. The line-up is yet to be announced, but we’re in love already. 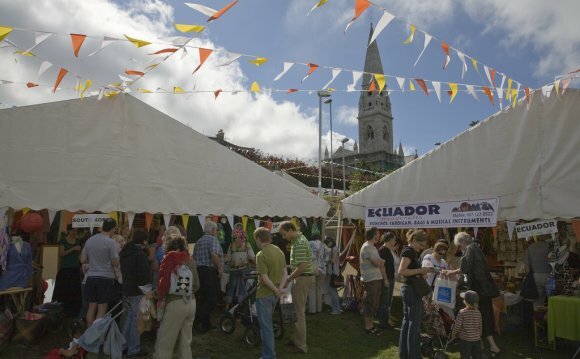 The obvious high point in Galway City’s calendar, Galway Arts Festival shows why the Town of the Tribes can rival the capital any day when it comes to a unique and invigorating cultural experience. Street parties, silent discos, comedy shows, plays and live gigs, this festival showcases the best Galway and Ireland have to offer and it’s on for a full two weeks! Although based around the competitions for the world’s amateur Irish traditional musicians, Fleadh Cheoil is for anybody with even a slight interest in listening to traditional music. Walk into any pub, hotel or restaurant and you’re sure to find a session of musicians to keep you entertained for the evening, that’s if you can get through the dancing on the streets. The Fleadh hits Sligo town again this year for the best session in Ireland and possibly the world. Enjoy Kilkenny’s medieval streets with this festival, which fills more than 30 venues throughout the city. For twelve hours each day, folk, blues, bluegrass, rockabilly and cajun-inspired music takes over as acts from all over the world descend for the weekend. As if picturesque Killarney didn’t already have enough to offer, the Music and Food Festival sees 20, 000 music and food fans flock to the Kerry town for a seven-stage extravaganza of festival fun. Duran Duran and Jools Holland are the headline acts this year. Let's hope the week if as good as Rio!